It is getting close to winter and you can’t wait to go boot shopping! But if you are like Jennifer and myself, finding tall boots is not always easy. In fact, trying to stuff your calves into a boot can be downright painful. What is the best solution for this problem? Anna Bassham from ShoeSmitten graciously contributed a post for us on the best tall boots for those difficult calves! Let’s be honest: trying on tall boots can be a real nightmare. If you have muscular calves like me, sometimes you come out of the shoe store exhausted and sweaty from all the pushing and dancing around. And women with thinner calves can find themselves looking like they are drowning in oversized boots. 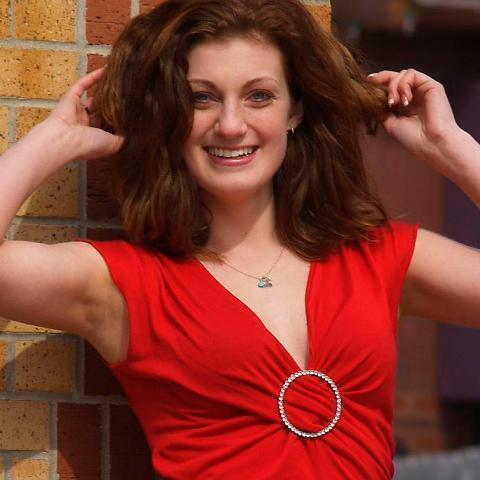 But if you know what kinds of boots work for your calf size, than you can eliminate the stress and the boot shopping experience can be what it should be – FUN! Let me start with one type of boot that will work for every body type: the stretch boot. Of course, this is a logical choice because it will stretch to fit your leg just right. The only down side about these boots is that they don’t usually look great over jeans, so you’ll either have to go with bare legs or tights. 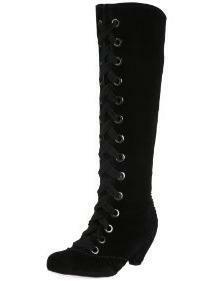 I suggest the Tara Tall Shaft Boot ($39.99 at Payless) for a purchase that will last you years. It has hidden elastic at the calf for a comfortable fit. 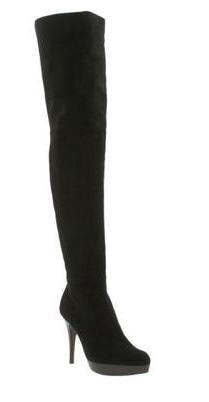 Now if you want to try out the over-the-knee boot trend with a stretch boot, the Nine West OTK boots fit like a glove and look marvelous with tights. Ladies with lanky legs: first of all, I am jealous! You can fit some of the most elegant designer boots out there with ease. However I do understand that you can have trouble with boots looking too big on you. Not to worry – many boots these days come with built-in help, such as front laces or buckle straps. The Corso Como Cable boot has a lace-up front so you can cinch them as tight as you like. And if all else fails, you can always go with a slouchy boot. After all, slouchy boots are not designed to offer a sleek profile. Bonus: slouchy boots look great both scrunched over jeans and paired with a dress. 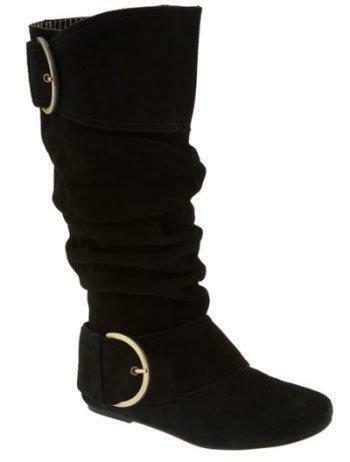 When it comes to slouchy, I love the Naughty Monkey “Cool for School” Boot. Finally, I have to urge you to flaunt your fabulous legs with a pair of thigh-high boots! 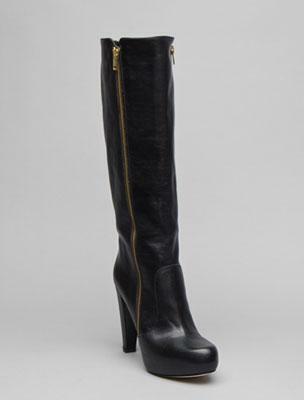 Try the Stuart Weitzman ‘Hiho’ Thigh High Boot with a mini dress or shorts. 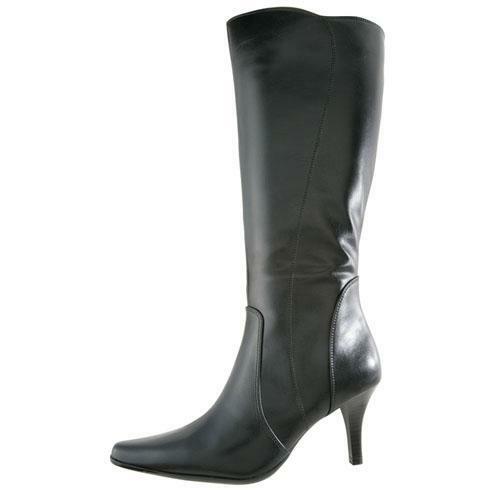 The top circumference of your sleek, tall boots should fit snug around your calves. But you shouldn’t feel like your circulation is being cut off! If you have thicker calves, search for boots made of pliable leather or soft suede with full side zippers for easy on-and-off. I like the Loeffler Randall Piper Double Zipper boot because it is a great modern basic, and it has zippers down both sides. Slouch boots also work well for larger calves, because they camouflage any bulges you wish to hide and they can give you an overall balanced look. Try the Colin Stuart Ruched Sueded Boot, a fabulous wedge boot that is fashion-forward and chic. As a final note, I just recently discovered a boot company that has devoted itself entirely to offering women with boots that fit the calf perfectly. Duo makes knee-high women’s boots with a made to measure fit available in 21 calf sizes, and in every foot size from 2 through 10! The boots are a little pricey, but I don’t think it’s too much to ask considering the boots will fit you perfectly. I would highly recommend Duo boots. I bought a really great classic black boots with pointy tow from Duo. That was two years ago, and I am still so happy with them and wear them every winter. They are well made, beautifully finished and are really comfortable. Duo is based in the UK, so the prices are in pounds and I had to pay shipping to Canada, but it was totally worth it and I do not regret the investment.